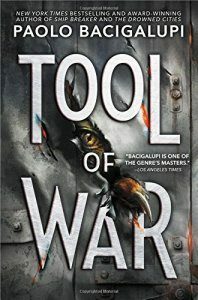 Tool of War, Paolo Bacigalupi (Little, Brown 978-0-316-22083-5, $17.99, 378pp, tp) October 2017. Paolo Bacigalupi’s Ship Breaker trilogy, which concludes with Tool of War, began as a disturbing ecological fable of young people trying to survive by mining ruined oil tankers for copper and other resources in a devastated southeastern US, mostly around New Orleans, then moved to an almost equally devastated DC area in The Drowned Cities. Over the course of the trilogy, though, the inundation of the coastlines began to serve mostly as background to the violent post-government society dominated by brutal corporations and even more brutal fiefdoms, religious cults, warlords, and criminal gangs. Tool, the superhuman “aug­ment” who protected the youthful protagonists of Ship Breaker, was the only major character held over in The Drowned Cities, but he becomes the central figure in Tool of War, which, with the aid of a bit of plot-coupon cashing, manages to reintroduce characters from both the previous novels, thus providing a conclusion that unites the three novels narratively as well as thematically. 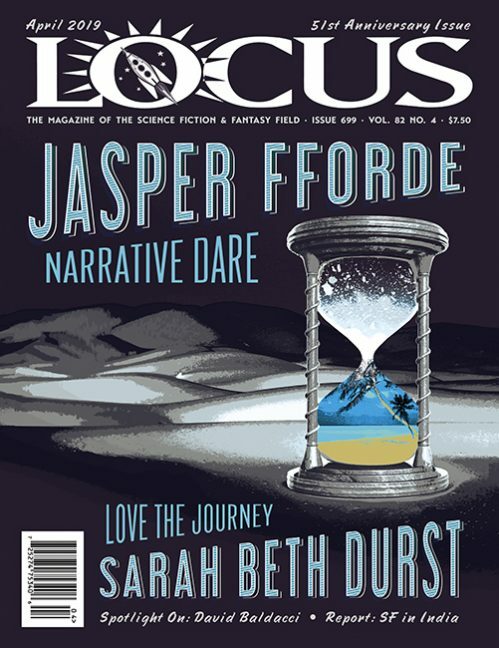 The central theme of the trilogy turns out to be one of SF’s most venerable: the power differential between the creator and the created, between the owner and the owned, between freedom and compulsion. There are times when Tool, a far more complex character here than earlier, calls to mind everything from the latest Planet of the Apes reboots, all the way back to Bladerunner, Capek’s R.U.R., and even to the ur-text of such tales, Frankenstein. 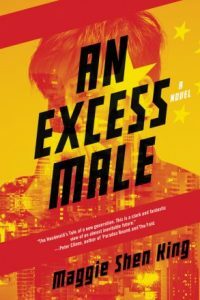 What Bacigalupi adds to this familiar dynamic is a level of raw brutality that seemed surprising for a YA novel even from the first volume, and – perhaps more important – a clear line of causation between environmental catastrophe and the disintegration of civiliza­tion. There’s a mad scientist of sorts in the novel, which gives Tool a personal stake in his mission of revenge, but the trilogy as a whole suggests in quite direct terms that a single madman, or a single vicious corporation, couldn’t gain this kind of power were it not for the bad decisions we’re making right now. (In an unsettling way, the series began moving toward the Trump era well before there was a Trump era.) 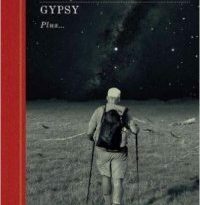 Many YA dystopias (and they’re still coming along with the regularity of Poke Monsters at an outdoor music festival) tend to mutter vaguely that something bad happened in the past in terms of our stewardship of the planet, leading somehow to the current malaise; Bacigalupi wants to show us exactly how we can get from here to there. The drowned cities that provide the controlling metaphor of the entire series are far too convincing for mere background or scene-setting. That said, it does make for some terrific scene-setting. The novel opens with two alternating points of view: Ariel Jones, an intelligence analyst for the ruthless Mercier Corporation trying to track down Tool from her station in the corpora­tion’s war-dirigible, and Tool himself, still in Washington, DC (never directly named) leading the improvised army with which he fought against the Army of God at the end of The Drowned Cities. Mahlia, the young woman whom Tool had rescued and protected in that novel, is escaping with her friends Ocho and Van on a ship en route to the Boston area. This ongoing cat-and-mouse chase is the framework of the entire plot, with Jones growing more suspicious of the motives of her obsessive boss General Caroa – who clearly has a personal vendetta against Tool, for reasons that become apparent later – while Tool, with his heightened senses, lightning reflexes, and not-quite-invulnerable body barely manages to escape the ridiculous amount of ordnance deployed against him. 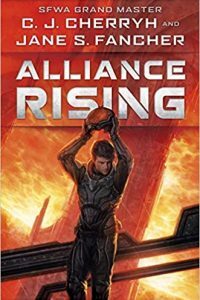 Enough stuff gets blown up to put Michael Bay or Roland Emmerich to shame, and Tool himself suffers mightily before revealing new powers that we hadn’t suspected in the earlier novels. From the point of view of the Mercier Corporation (which joins the Tyrell Corporation and Bacigalupi’s own AgriGen among SF’s most venal corporate villains), Tool is intellectual prop­erty gone rogue; from Caroa’s point of view, he’s a threat to the survival of humanity. As in the earlier novels, the wider world is pre­sented only in occasional glimpses; we learn of Patel Global, which for a while shields Tool from his pursuers, and of other economic entities such as the Chinese Co-Prosperity Sphere, the West Af­rican Technology Combine, and the Mediterranean Free Trade Zone, but reference to any traditional nation-states is notable by its absence. But in the end, the novel depends less on this background, and less on its action setpieces (such as a terrific battle aboard that dirigible), than on the character of the humanized monster Tool, his allies and en­emies, and on the moral dilemma faced by Ariel Jones, whose ambition to advance in the Mercier Corporation conflicts with her own sense of hu­manity and justice. None of this is particularly new in SF – in fact, it seems an almost deliberate revisiting of classic themes – but Bacigalupi’s execution of these themes grandly concludes a trilogy which is as thrilling and thought-provoking as anything in recent young-adult SF.